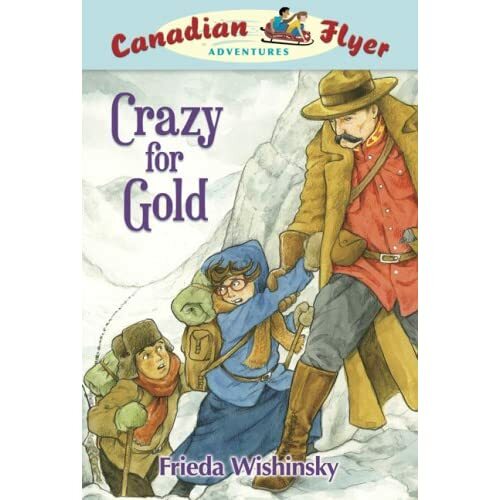 Canadian Flyer Adventures is a cool new historical adventure series put out by Maple Tree Press. The books are written by Frieda Wishinsky, and wonderfully illustrated by Dean Griffins. 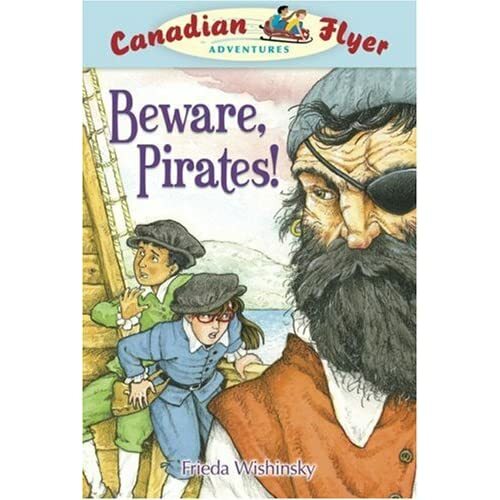 This weekend, the last before school started up again and sadly a rainy one, I read two of the four now available, Crazy for Gold and Beware Pirates. The series is aimed at grade two or perhaps grade three, and each title is a stand-alone, content driven historical adventure designed to inform as well as entice. The stories feature Emily Bing and her new friend Matt Martinez . Together they discover a magical sled in the attic of the house Emily's parents have inherited from her Great Aunt Miranda. Time travel adventures quickly ensue. The first book in the series involves an encounter with one of Queen Elizabeth's privateers, Martin Frobisher and his search for the fabled Northwest Passage. The children find themselves on his ship, are ordered to swab the decks. Instead, they befriend a native, visit his home, witness a kidnapping, carry out a rescue, and make it back to the safety of Emily's attic. Another of the adventures finds the children Klondike bound. They face hunger, bitter cold, the grueling climb to the Chilkoot Pass summit and a dangerous trip through rapids before reaching the gold fields. They even meet Samuel Steele, one of the first to join The Northwest Mounted Police, who kept the peace through the gold-frenzied rush. One of the features of the series that will appeal to both kids and teachers is the information section at the back of the book. It is cleverly divided into "Emily's Top Ten Facts", "Matt's Top Ten Facts", and "So You Want to Know: from Author Freida Wishinsky". To find out more about other titles in the series, visit the Canadian Flyer Website.